This enhanced map of Mercury's northern pole exaggerates the colors to reveal insights about the different types of rocks on the planet's surface. The 181-mile-wide (291 kilometers) Mendelssohn impact basin shown at the bottom right may have once been nearly filled with lava. The bright orange region at the top shows the location of a newly identified volcanic vent. A stunning digital model of Mercury unveils the planet's striking landscape, while other new maps provide a closer look at the shadowed northern pole and reveal the highest and lowest points on the closest planet to the sun. Built with data from NASA's MESSENGER mission that orbited Mercury for four years, the new maps offer a bounty of scientific insight, while also delivering an incredible view of the planet. "The wealth of these data, greatly enhanced by the extension of MESSENGER's primary one-year orbital mission to more than four years, has already enabled and will continue to enable exciting scientific discoveries about Mercury for decades to come," Susan Ensor, a software engineer at the Johns Hopkins University Applied Physics Laboratory (APL) and manager of the MESSENGER Science Operations Center, said in a statement. Another new map released by NASA probes the northern poles, where the sun usually sits low on the horizon and shadows run long. MESSENGER discovered that volcanic activity in the past buried the northern region beneath lava as much as a mile deep, spanning an area about two-thirds the size of the continental United States. 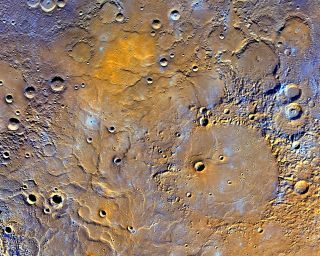 MESSENGER's Mercury Dual Imaging System (MDIS) instrument captured photos when filters could best minimize the shadows, revealing the northern volcanic plains in a wealth of color. "This has become one of my favorite maps of Mercury," MDIS Instrument Scientist Nancy Chabot of APL said in the statement. "Now that it is available, I'm looking forward to it being used to investigate this epic volcanic event that shaped Mercury's surface." NASA also released the first global map of the planet produced by X-ray fluorescence spectroscopy, created by MESSENGER's X-Ray Spectrometer (XRS). The XRS map provides a chemical map of the planet that will help scientists better understand Mercury's geological history. At the conclusion of its mission last April, MESSENGER was deliberately crashed into the planet. The tiny spacecraft's scientific bounty continues to live on, however. "During its four years of orbital observations, MESSENGER revealed the global characteristics of one of our closest planetary neighbors for the first time," said MESSENGER Principal Investigator Sean Solomon, director of Columbia University’s Lamont-Doherty Earth Observatory. "MESSENGER's scientists and engineers hope that data from the mission will continue to be utilized by the planetary science community for years to come, not only to study the nature of the innermost planet, but [also] to address broader questions about the formation and evolution of the inner solar system more generally," Solomon said.